The bell jangled over the low murmur of conversation and wisps of laughter. His face obscured by a hooded cloak, Oryn stepped across the worn threshold of the crowded tavern. The patrons spared him a glance before returning to their ale and concerns about the Guild’s offer to the inhabitants of Last Hope, uninterested in an old man wearing a shabby cloak, leaning on a gnarled walking stick. A fleeting smile touched Oryn’s lips. He shuffled toward the back corner. Only the man seated at the back table took notice. A guttering tallow candle illuminated his tight-lipped expression. One hand rested on the dagger in his belt. Tense. Ready to bolt. The quarry of a relentless hunter. Oryn approached him. The candle flickered, sending shadows skittering across the low ceiling blackened with the smoke of many years. He wrinkled his nose. The stench of strong ale and stale sweat was heightened by the pungent undercurrent of poverty and desperation clinging to the crowd, and even more strongly to the man seated across from him. “May I join you?” Without waiting for a response, Oryn sat. He lowered his hood and brushed the shaggy white hair from his face. Oryn’s gaze shifted to the five-year-old girl perched on a barstool. She spoke earnestly to one of the barmaids. Her pale face was smudged with dirt, her brown hair unruly. Her ragged clothes revealed skinned knees and elbows. Others saw no more than a barefoot waif, but Oryn glimpsed the gossamer threads of fate entwining the girl named Sydney, visible only to his wizard’s eyes. The interweaving strands of possibility formed a constantly shifting tapestry, easily unraveled by the slightest alteration. “Not now, Sydney,” Edgar said with a weary smile. He gave her a gentle push. Her green eyes fixed on Oryn. He sensed a momentary spark of recognition, as if she realized what he was. Impossible. She isn’t a wizard. Perhaps I’ve overlooked something. Sydney embraced him before darting back into the crowd. The barmaid she’d been talking to earlier caught her hand and led her to a staircase across the room. “Every parent makes sacrifices for his child.” For an instant, he faltered under Edgar’s fierce stare. “To give Sydney a better life, you must teach her to do what is right. Make your life an example for her to follow.” From within the folds of his cloak, he drew forth a leather purse and placed it beside the empty tankard. “If…now if I do what you ask…I’d expect you’d be in my debt.” Edgar placed his hand on the purse, fingers clenching the soft leather. “Indebted? To you? Really, Edgar.” Oryn curtailed a sharp laugh and leaned back in his chair. Oryn stood and put a hand on Edgar’s shoulder. “I’ll count on you. Be well, Edgar.” He moved toward the door, his mind a jumble. Much remains to be done. He tarried in the doorway to glance back and saw Edgar press Sydney’s coin to his lips. 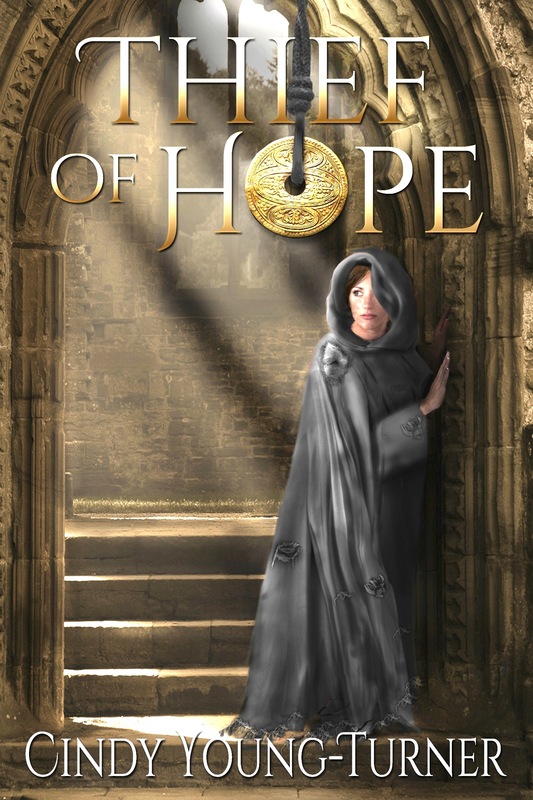 Raising his hood, Oryn stepped into the muddy cobblestone street and dodged a puddle. Light rain beaded on his wool cloak. He leaned on his staff, his shoulders sagging. He’d just committed a man to certain death. A good man, who deserved more hope than he could offer. In these dark times, the Kingdom of Thanumor desperately needed hope. Not long ago, when the world was young and the veil between the realms of human and faery was whisper thin, enchantment and magic had inspired the kingdom and its people. Now, magic was looked upon with distrust, even heresy. Hope was a fragile creature. Oryn had held it, fluttering, diaphanous, a delicate heartbeat thrumming beneath his fingertips. Grip it too tightly, and hope would be crushed, forever lost. Let it go, and hope might grow and expand to many who needed it. A light flared in one of the second-story windows, and a child’s face pressed to the glass. She fixed him with her stare, her green eyes luminous in the darkness. This time, Oryn knew her. The realization rattled his weary bones. He turned, his staff tapping in time with his quick footsteps, his knowledge wrapping him in a cloak of apprehension. Without the proper guidance, hope might also grow wild and untamed, a creature transformed, all nails and teeth and harsh angles. A creature to be feared. I really enjoyed what I have read of your book and look forward to the rest of it! Your mother sent me the link and I always enjoy seeing the pictures of your daughter she has to share. Awesome! Loved how you added in intrigue and mystery into the opener! This book is a wonderful and fast-paced novel that will leave you breathless. Thoroughly researched and realistic, this is an exciting and provocative read. Thanks, Sherry! I had a good editor. 🙂 The final result makes the sometimes painful editing process all worthwhile.